Hi folks. I hope Alex (our esteemed Uncle Gorby) doesn’t mind me borrowing his column from time to time while he’s on hiatus. I wanted to point you towards another fun distraction. Since the Walking Dead is now a successful TV Show, it’s as good a time as ever to get introduced to the comic. Luckily for you, Newsarama has put up the first issue for you to read! 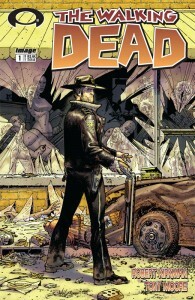 The Walking Dead #1 is a black and white book put out by Image created by Robert Kirkman and Tony Moore. I’d actually never read any of it before today, but I really enjoyed this first issue. It’s extremely easy to get into, with no plodding beginning or unneeded explanation. It leaps right into the heart of things – showing you what makes the main character tick. I’ve never been a big fan of zombies (I don’t like gore, believe it or not) so the book wasn’t really on my radar. But it’s reminded me that good horror is really all about exploring humans, not monsters. If you liked the first issue you should try to pick up the compendium cheap off of Amazon, as it contains the first 8(!) trade collections for only $35. I have read every issue of TWD since it first came out and I am stoked that it is now a live action series too. wow that’s a pretty great deal. Do you know if they’re going to be doing a second volume like that? The first compendium contained the first 48 issues, and the ongoing is up to it’s 78th issue now. So if they are to publish another compendium it’ll be two years away. They will most likely publish one though, as image (& top cow) comics seems to like to do that with their longer series, such as rising stars or the darkness.